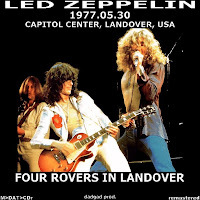 One of my favourite 77 shows, did you fail to notice the little mishap after the solo on NFBM? I assume you mean Bonzo's errant cymbal crash as Page's guitar solo comes to a close? In writing these reviews, my goal was to provide an overview of the show on a whole, along with any relevant or interesting details of the performance. Not necessarily to create a comprehensive list of minutia. Something like that surely would have taken much longer to write and be much less interesting to read. Someone in the audience shot a bottle rocket at the stage which somehow managed to set Robert Plant's shirt on fire, which may account for the sloppy second half of NFBM. Sorry to be the contrarian here but with the new soundboard release of 5/30, it's abundantly evident that the band is quite sluggish at the start of the performance and Bonzo, in particular, is not drumming at his best. He's solid but he's not drumming with the explosiveness of LA, that is for certain. A much better performance is 5/25 where the band has much more energy. Can't think of a better performance of no quarter than this one and that's saying something. I'm really surprised not more people praising it.